This recipe is one that is very special to my family! 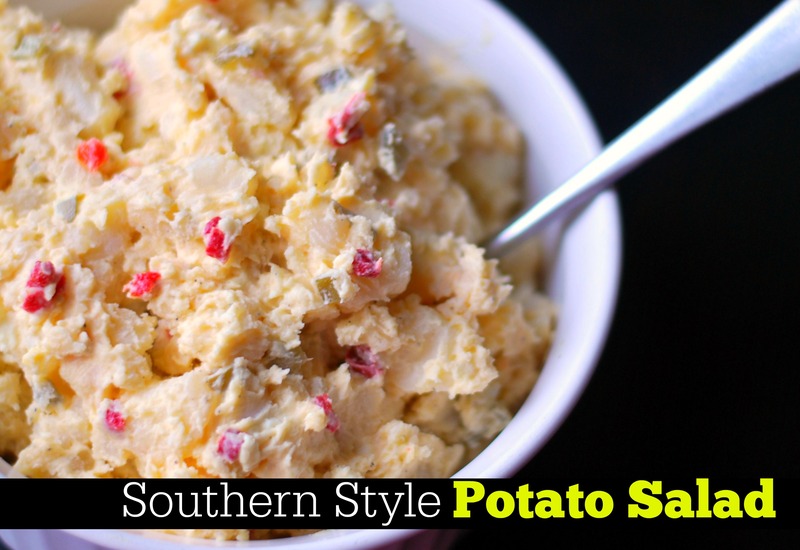 My mother has always been asked to bring this potato salad to family gatherings. It is the absolute best and just the smell of it being prepared brings me back to my childhood. It is DELICIOUS, but I couldn’t tell you that when I was growing up because I wouldn’t eat mayonnaise. I started eating mayonnaise after I got married and got to try my mama’s famous potato salad for the first time and COULD NOT BELIEVE what I had been missing!!!! I have more than made up for all the potato salad I missed out on growing up and now I am so thrilled to share this extra special recipe with you all! Make sure to make this a day or 2 ahead of time because it is SO much better the next day! Rinse and scrub potatoes and place whole and unpeeled in a large pot of salted water along with the eggs. Bring to a boil. Boil until tender but still firm, about 15-20 minutes. Test by piercing with a sharp knife. Remove the eggs and place into ice water to cool. Remove potatoes from hot water and set aside until cool enough to handle, but still warm. Peel and cut potatoes into cubes and place into a large serving bowl. Add salt, pepper, pimentos and pickles to the potatoes. Peel and chop cooled eggs and add to the potatoes. In a separate bowl, combine mayo, mustard and pickle juice. Add mayo mixture to potatoes and stir to combine. Taste to adjust seasonings. Chill overnight before serving. Can you please clarify the amount of sweet pickle juice required for this recipe. Not sure if it should be 1/4 cup or 1/4 Tsp? Oops! I fixed it in the ingredient list! It is 1/4 cup plus 2 Tbsp! Sorry about that!